MPTF is proud to continue its support of music education in the schools. 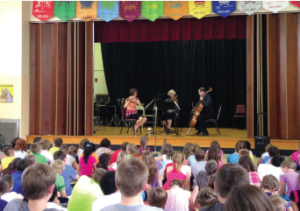 Through MPTF support, the Allegria Ensemble recently performed a program called “How to Listen to Classical Music: What to Know to Enjoy the Show” in five Centre County schools. Above, Allegria Ensemble performs at Houserville Elementary School in State College, Pennsylvannia, August 5, 2014. On April 30, 2015, the Music Performance Trust Fund (MPTF) wrapped up its fiscal year for the 67th time in its storied history. The 2014-2015, 12-month period was an eventful one. We co-sponsored 2,777 performances throughout the US and Canada—music festivals, community programs, educational initiatives, and outreach for seniors. This was an increase of 663 events over the previous year. More than 17,000 musicians’ payments were made to supplement their income. And, hopefully, the value and importance of continued live music has been meaningfully reinforced. While there were many highlights this past year, we did create a few “firsts.” Our biggest and most ambitious initiative was the launch of MusicianFest, which put musicians in 500 senior centers across the US in just four months. Not only do these events entertain, but they also comprehensively support the knowledge that live music has a physical and psychological impact on the well-being of older citizens. The MPTF co-sponsored a concert in Tulsa, Oklahoma, July 16, 2014. The theme of the concert was Movie Night. Starlight Band played popular movie themes from past and present. A screening of a silent short film, accompanied by live theatre organ music, followed. More than 1,100 people enjoyed this phenomenal concert! Partnering with the National Council on Aging validates the need for this type of program. MusicianFest carries through to the end of this month. Though performances may appear to be a small at the local level, in the aggregate, they give the MPTF a national profile to potentially attract interest from corporate sponsors, which would help to sustain the organization. We appreciate the support of Robert Jaffe, trustee of the Film Funds, who helped us make MusicianFest possible. We, at the MPTF, have come to depend upon the Film Funds for new initiatives. The Film Funds helped us partner with the Broadway League to create and present a free live concert in Shubert Alley to kick-off Tony Week in New York City. Performers from 20 Broadway musicals joined a 12-piece band that surprised and rocked thousands of fans on a matinée day, in the heart of the theater district. Emphasizing the excitement and the talent of musical theater is an added stimulant to keeping the challenging theater business prosperous. It worked so well in 2014 that we did it again just a couple of weeks ago. 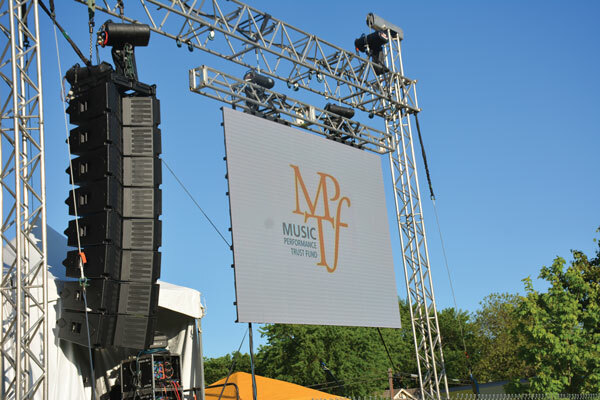 The MPTF and the Film Funds have provided similar vital support to the Chicago Lyric Opera. An early September annual free opera performance, Stars of Lyric Opera at Millennium Park, attracts more than 15,000 people, galvanizing interest in the entire opera season in the Windy City. It introduces opera to new audiences and provides access for many who could never afford tickets to such an illustrious event. It is the cultural impact through live music that creates deep, social fiber in the soul of our communities. AFM members should elaborate and amplify upon this short list of events. It is an effort and a tradition that has been shared for 67 years. 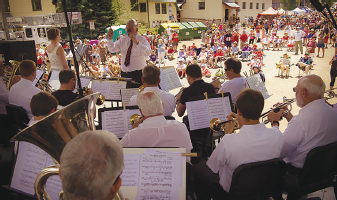 Boston Brass performed a wonderful concert on July 12, 2014, in Crested Butte, Colorado. 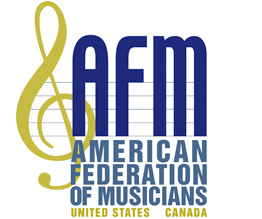 However, it is important that we also share the challenges that continue to face the MPTF, as well as the overall professional music community. Our revenue continues to drop precipitously. The sharp, downward trajectory of general signatory revenue has averaged approximately 22% every year, for at least the past six years. This year that revenue abruptly fell by nearly 30%. How does the MPTF survive this dramatic, continuous, downward trend? We continue to cut overhead costs. This past year, we reduced those costs by $180,000, or roughly 20%. The dramatic change in the operation of the MPTF is best exemplified in the staffing. Just over three years ago, there were 15 employees. We now operate with three. How much further can we cut? What this means for the future is that our grant funding is getting tighter. This fiscal year, our grant budget will be $500,000, which is equal to our grant disbursements this past year. Along with trying to maintain the overall amount of our grants, our primary job is to protect the high quality annual events that are under constant threat by our revenue reductions. Reality tells us that we cannot entertain new grant investments without eliminating previous commitments. Essentially, all of our efforts to support new events or initiatives have come through the generosity of the Film Funds. However, they too face revenue challenges this year and in the years ahead. Our strategy with MusicianFest was to showcase a comprehensive, need-based initiative that has branding capabilities. 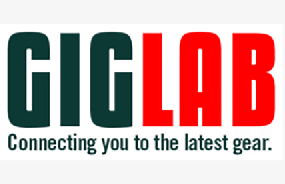 We are hopeful that, with the initial success of this campaign, we can finally interest a corporate partner to invest. These are not easy sells. This is an area that the MPTF did not explore to any great degree until the most recent two years, when the urgency became paramount. Attracting and securing corporate partners by building our value and our profile is essential. We are making strides in our efforts, but it is a long process. Will revenue return to more sustainable levels from the signatories? We hope so, but it is imperative that we not rely on it. Reliance on a single source was a luxury when the marketplace was flush with CDs, cassettes, and vinyl. This is the new world of digital, and unfortunately, the MPTF receives only ancillary income from digital that amounts to roughly 3% of our total revenue. What survives 67 years in modern society? It must be something of deep value to the community and to those directly involved with it. We believe those standards to be true of the MPTF. However, it will take the efforts of everyone concerned to keep MPTF sustainable and to continue to provide the utmost value to communities across North America. Although we are an independent foundation, we look forward to a greater bond with our event partners, including the musicians, educators, healthcare professionals, music industry executives and organizations, and community leaders who understand the importance and impact of live music performances on our culture and society.